Founded in 1934, publically traded William Hill PLC backs its online gambling operations with more than seven decades of gaming experience and a well-earned reputation for fair play. The company started handling sports bets via the Internet in 1998, placing it among the world's oldest online sports books. 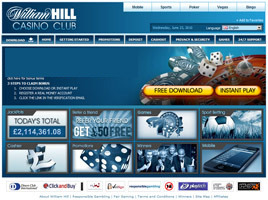 Two years later, the William Hill Casino web site was launched. It soon attracted over 800,000 account holders, making it the U.K.'s most profitable virtual gambling operation with pro-forma annual net revenue of £190 million. William Hill Casino offers ten different gambling areas on its interlinked web sites, all of which can be accessed from a single player account. Central among these is the Casino section, with 150 Instant Play and Download games available. Utilizing the latest Playtech software, highly realistic graphics are achieved, such as cards bending slightly as they are dealt and dice wobbling before coming to a stop. The audio is top-notch, too. Eleven different progressive jackpots are featured - not only slots, but also bonus versions of roulette and poker. There are arcade games, video poker, "casual" games, and constantly changing new games. Table games range from the traditional favorites - roulette, blackjack, baccarat and craps - to the more unusual Sic Bo, Red Dog, and Pontoon. The Vegas section offers slots and table games, too, plus such innovations as Vegas Solitaire, Slottolette, 3-Card Brag, Hexagon Roulette, and a variety of scratch cards. The 3D roulette game is especially inviting, with a female croupier making calls over soft jazz music playing in the background. Games can be accessed in Instant Play mode or using an optional "Demo" feature to sample them for free. The Live Dealer section is where the virtual world gets real at William Hill. Three popular games - Blackjack, Baccarat, and Roulette - are offered in real time, with young female dealers manning the tables. By using a special chat function, players can text message the dealers during play. A Games section extends the casino experience to TV and movie themed video slots, from Spiderman and King Kong to Deal or No Deal. The Skill section allows players to pit their talents directly against each other in Dominoes, Backgammon, Pineapple Poker, and more than a dozen other challenges. And the Virtual section invites players to try their hand at handicapping computer-generated horse, dog, and auto races. Four other gaming areas are linked to these on every player account. Lotteries issues tickets for six-ball and seven-ball draws of the Irish, New York and Spanish lotteries, while Bingo is the place for 75-ball, 80-ball and 90-ball games, bonus games, and a wide variety of side games. The Poker section offers Texas Hold'em, Omaha, and 7-Card Stud as sit-and-go tournaments, cash games and multi-table tournaments. Of course, Sports is also a William Hill mainstay. In this section, bets are accepted on everything from American football, basketball and baseball to cricket, snooker, and darts - more than 60,000 events a year in over 30 sports. Wagers are even allowed on the outcomes of certain reality TV and game shows. The long-standing Casino Club 100% First Deposit Bonus gives each new player a reward for initial funding. Qualifying deposits are limited to a minimum of £35 and a maximum of £300. Then, ongoing bonuses are what keep players coming back to William Hill Casino time and again. Depending upon the section in which the account has been established, deposit bonuses are offered to encourage funding. It is absolutely possible, and for many players desirable, to participate in all ten gaming sections, collecting bonuses for initial deposits and play. But William Hill rewards loyalty, too, with 20% redeposit bonuses up to £1,500 each month, £50 free (with 35 times wager) for each new referral made, and comp points for every £10 wagered. The latter can be redeemed for instant cash, additional bonuses, and prizes. William Hill's promotional programs can be a bit confusing at first, but it is easy to start taking advantage of them. New players simply click the "Claim Bonus" button when they first log in to the web site. This automatically serves as opt-in registration for all future promotions for which the player qualifies. Notifications of eligibility are sent out by email, clearly explaining what's needed to claim the bonuses. I meant to post my comment here, sorry. Here it is: If I deposit £24 does that mean I will be able to play with £34? (bonus of £10). And also, what are the wagering requirements for this sort of bonus?